As seen in the New York Times, Wall Street Journal, Washington Post, New Yorker, The Economist, Financial Times, Bloomberg, The Atlantic, Foreign Affairs, Politico, City Journal, National Review, Claremont Review of Books, Time, American Interest, American Conservative, Salon, The Nation, The Baffler, The Week, New York Post, Times of London, Washington Free Beacon, Axios, Project Syndicate, and more. The WORLD Magazine Book of the Year for Understanding America. Working-class voters tried to send a message in 2016, and they are still trying to send it. The crucial question is whether America’s leaders will listen and respond. One way to start doing that is to read Oren Cass’s absolutely brilliant new book, “The Once and Future Worker.” The first part of the book is about how we in the educated class have screwed up labor markets in ways that devalued work and made it harder for people in the working class to find a satisfying job. . . . “What if people’s ability to produce matters more than how much they can consume?” Cass asks. The bulk of his book is a series of ideas for how we can reform labor markets. This dilemma is apparent in the vigorous intra-conservative debate over a new book, “The Once and Future Worker,” written by the former Mitt Romney domestic policy director Oren Cass. In certain ways the book is an extension of the reform-conservative project, an argument for policies that support “a foundation of productive work” as the basis for healthy communities and flourishing families and robust civic life. But Cass is more dramatic in his criticism of Western policymaking since the 1970s, more skeptical of globalization’s benefits to Western workers, and more dire in his diagnosis of the real socioeconomic condition of the working class. . . .
Free trade, too, has come at a cost. “What if China sends $50 billion worth of electronics to the United States and we send $50 billion worth of U.S. Treasury bonds back to China?” asks a new book, The Once and Future Worker. Its author, Oren Cass, has one of the sharpest policy minds in this new vanguard. His pedigree is surprising. In 2012, the year he graduated from Harvard Law School, he was a top policy adviser for Mitt Romney at age 29. He now writes for the Manhattan Institute. “The issue that came up after the 2012 campaign was, What does conservative antipoverty policy look like?” Cass says. . . .
Cass’s book, timed for publication the week after the midterms, could either be the battle orders for a second Trump term or a to-do list for a successor stamped in the same mold. There is no mistaking the Trump-inflected themes of nationalism, populism and criticism of free trade. 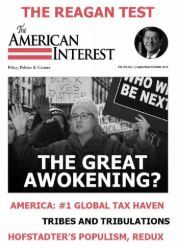 Cass, an alum of Bain & Co.–the progenitor of Romney’s Bain Capital–now wants “to combat the unfair trade practices of nations like China,” which threaten “to reduce opportunities for workers, lower the trajectory of their productivity and diminish the nation’s real prosperity.” He also goes after globalization. Currently “we free employers from the constraints of using the existing domestic workforce,” he writes, “offering them instead an option of using much cheaper foreign workers overseas or bringing the cheaper workers here.” Sanders and Bannon would agree. Cass is less inhibited than most because he’s a free agent. These woes are not the inevitable result of irresistible global and technological forces. They are the direct consequence of a decades-long economic consensus that prioritized increasing consumption―regardless of the costs to American workers, their families, and their communities. Donald Trump’s rise to the presidency focused attention on the depth of the nation’s challenges, yet while everyone agrees something must change, the Left’s insistence on still more government spending and the Right’s faith in still more economic growth are recipes for repeating the mistakes of the past. In this groundbreaking re-evaluation of American society, economics, and public policy, Oren Cass challenges our basic assumptions about what prosperity means and where it comes from to reveal how we lost our way. The good news is that we can still turn things around―if the nation’s proverbial elites are willing to put the American worker’s interests first. Brad Wilcox, Wall Street Journal: "For too long, the American working class was ignored in politics and public policy. All that changed in 2016. The election served notice that the working class, especially working-class men, felt overlooked, alienated and angry and were desperate enough to try anything—even Donald Trump. Two powerful books now tell us why." Ron Haskins, National Review: "The market is now flooded with books that claim to explain the flaws in the American economy... But one book stands out for its originality and the depth of its analysis." Jason Furman, GoodReads: "A thoughtful, provocative, carefully argued book that made me change my mind on some issues that I thought I’d thought about quite a lot, which is about the best a book can do." Michael Rosen, Claremont Review of Books: "The pro-worker producerism perspective has generally lacked serious intellectual support, apart from certain precincts of the far left. 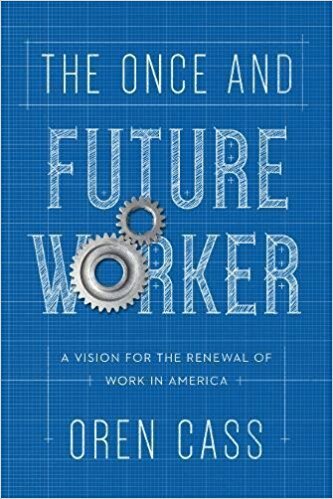 In The Once and Future Worker, a provocative but well-reasoned manifesto for reinvigorating the labor market, Oren Cass corrects that oversight and furnishes the needed intellectual backbone." Catherine Tumber, The Baffler: "As that rare tract refusing to cater to any pre-existing major-party or industry-lobbying agenda, it should be placed firmly on the table for serious discussion." Greg Weiner, Law and Liberty: "Nothing if not bold ... This is a book that demands to be read not just for its economics but for its politics." Brian Dijkema, Comment: "The boldest, most challenging, and most refreshing book of political economy I have read in a long time. ... It is refreshing to read an author so clear-eyed on the need for trade-offs and so singularly focused on making trades in favour of working-class Americans, even if it means wealthier, more powerful Americans have to sacrifice a few things they hold dear." Daniel Kishi, The American Conservative: "For those who believe that the country’s current trajectory is untenable, but balk at the alternative of ascendant democratic socialism, critical rethinking of our approach to public policy is necessary. Oren Cass’s The Once and Future Worker . . . is already proving an essential text for such a project." Mitch Pearlstein, Minneapolis Star-Tribune: "More than any book I’ve read in a long time, The Once and Future Worker is causing me and others to ponder some things anew. It’s that strong." Henry Olsen, UnHerd: "Cass’ groundbreaking work tackles one of the great issues of our time . . . [and] has unleashed a firestorm of criticism from the high priests of neoliberalism." Dani Rodrik, Project Syndicate: "How we balance these [economic] forces with the needs of communities will shape not only our economic fortunes, but also our social and political environment. As Cass and Rajan show, it is a problem that economists should no longer ignore." Marvin Olasky, WORLD (2018 Book of the Year): "In this political environment The Once and Future Worker’s analysis is particularly important. Cass points out that even a low-paying job develops experience at coming to work on time, developing skills, and entering into a social network that often leads to more opportunities." Charles Fain Lehman, Washington Free Beacon: "[Cass] calls this the 'working hypothesis: that a labor market in which workers can support strong families and communities is the central determinant of long-term prosperity and should be the central focus of public policy.' There is a lot of explanatory power in this simple idea." Sam Hammond, Salon: "Taken together, the arguments in The Once and Future Worker present a coherent critique of hyper-globalization paired with a strategy for re-empowering the working class." Jeff Spross, The Week: "This is a 180-degree turn from the orthodoxy that's ruled economic thinking — especially conservative economic thinking — for decades." Steve Levine, Axios: "[Cass] is asking the right questions and proposing what is probably needed — an upside-down change to economic policy."